We have changed our entire shopping experience at Salisbury Depot. A buy-up discount is now offered on all purchases of wine, spirits, liqueurs and coolers, with savings starting with a purchase of 3 products. The more you buy, the more you save - with savings of up to 15% on cases of 12. 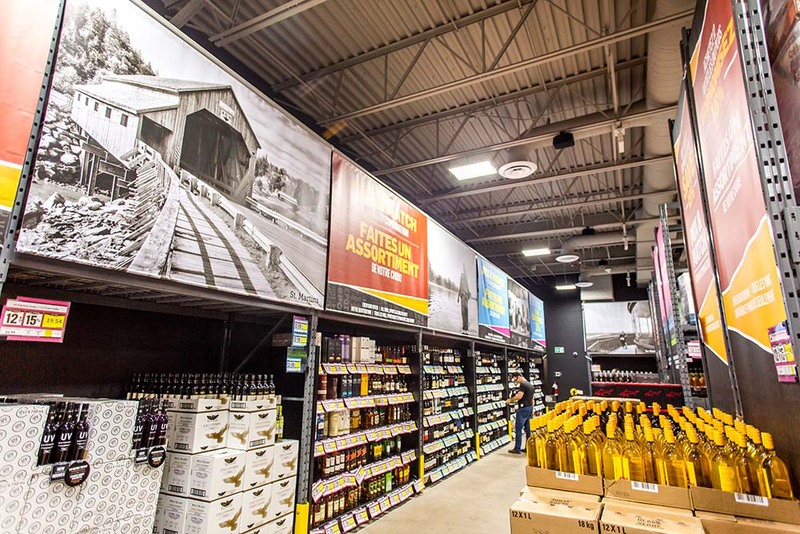 ANBL Salisbury Depot is a new store concept with a “warehouse” feel that is the first of its kind in Atlantic Canada. Prior to the renovation in Spring 2017, Salisbury was already a destination in the province, as it sits across from the Irving Big Stop. Anyone who has travelled through New Brunswick for business or pleasure will tell you that, wherever you are going, your travels will most likely take you through Salisbury. As you enter the store, the layout immediately says “wholesale” – this isn’t your normal retail experience. Tall, double-stacked pallet racking lines the perimeter of the store, and rows of racking form aisles across the room similar to what you might see at Home Depot and Costco. Floor-to-ceiling banners explain unique store features, and you might be approached by a smiling ANBL team member asking “How do you Depot?”. We know two answers will never be the same in this new, unique store. Some customers find that, although a volume discount is a great incentive to stock-up for holidays and occasions, a case of one certain product may be too much (even if it is your favourite Chianti at a great price). ANBL customers can mix-and-match any of the above-mentioned products and get the same volume discount. For instance – many customers beeline straight to the back wall of the store featuring premium wines and spirits from around the globe. What if you are a rum/whisky fan, and your partner prefers white wine? You can find familiar items such as Captain Morgan rums and popular Scotches, while being able to add a Chardonnay, a Pinot Grigio and Sauvignon Blanc to your cart to save. The selection is always changing, and don’t be surprised if you find something unique to Salisbury Depot. In the cold room, beer continues to be offered and primarily popular brands in larger formats. Although beer is not eligible for the volume discount, there are separate offers for the brews. Be sure to stop into ANBL’s Salisbury Depot and find out How YOU Do Depot. After all, all roads do lead to Salisbury!